In this epic, beautifully written masterwork, Pulitzer Prize-winning author Isabel Wilkerson chronicles one of the great untold stories of American history: the decades-long migration of black citizens who fled the South for northern and western cities, in search of a better life. Wilkerson brilliantly captures their first treacherous and exhausting cross-country trips by car and train and their new lives in colonies that grew into ghettos, as well as how they changed these cities with southern food, faith, and culture and improved them with discipline, drive, and hard work. 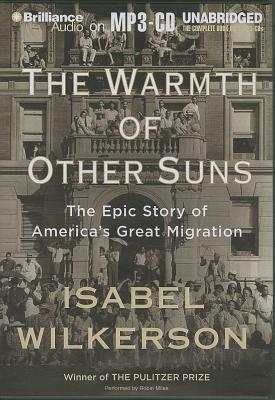 Both a riveting microcosm and a major assessment, The Warmth of Other Suns is a bold, remarkable, and riveting work, a superb account of an "unrecognized immigration" within our own land. Through the breadth of its narrative, the beauty of the writing, the depth of its research, and the fullness of the people and lives portrayed herein, this book is destined to become a classic.